What do you think of her designs? 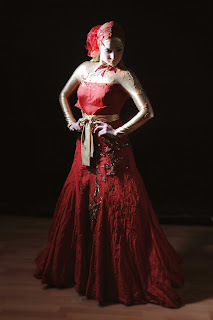 I like it, its very Egyptian and very popular for weddings and engagement parties - but its something that a lot of girls in Egypt do themselves - not the dress lol, but match the fitted lycra top to the dress and custmise it with some glittery stuff. There is actually a brand in Egypt that sells those tops in all posible colors. I would prefer if the lycra top wasnt playing such an important role in these designs. when i got my hijab fashion magazine i noticed these types of dresses. it looks nice and it shows we are able to nice dresses and adapt them to our islamic ways. i love the pink dress actually i like them all lol. can anyone tell me where i can buy the long sleeved tops, as here in the uk i only find plain old colours, would like to get some sparkly one inshallah. i think these r too tight and define the body shape which is against the idea of wearing the hijab. as for the designs themselves, i guess i rather c much simpler designs. its superb..it will be helpful we can leran the trick.. The designs are a little too far out of the realm of modesty! 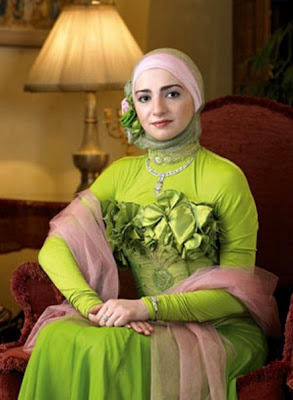 Egyptian "hijabi fashion" has gone a little too far with the color coding and tightness of their clothing. But that is just my take on it, since for me simplicity is the most beautiful modesty! I agree with Anon;too tight dresses. The bust and waist are usually too tight but they are beautiful. Covered does not equal concealed! Just look at speadskaters. I think the use of the fitted lycra tops under most of the dresses is not creative. In the third picture with the red dress, it seems that "tan" long sleeve top was selected to give the illusion of a sleeveless gown. At my first glance I thought the model was revealing her shoulders and arms. In my opinion Egyptian popular fashion is quite overdone and tacky. I'd like to see more classic, clean, and comfortable lines that don't reveal the figure too much. As with the colors, how about a variety. You don't have to wear the same color from head to toe. I also agree, I'd like to see the sleeves to be an extension of the dress. 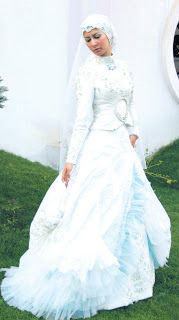 You posted a great website with Islamic wedding gowns called Eterntiy in the US. Those dresses are amazing! At first when I saw the wine coloured dress, I thought "O_O is she showing her arms!?!" But then I realized it was tan-coloured cloth. This seems to me to be a violation of hijab, since hijab is not meant to draw attention to oneself overly much. There's a big difference between being fashionable and elegant, and being eyecatching, i think this is the latter. Overall I agree that her designs are way way way too tight. I wouldn't wear them. Also the one she's wearing in the main photo... not to be mean, but she looks like a figure skater!! Her white wedding gown might be very nice if it's not too tight. The green thing? Never, ever. First I am a minimalist. Second, perhaps coming from the NYC metro area, this look is just too much loke ribbons wrapped around a body suit. Not working. I have seen designs of Heba Idris. I want one of the wedding dress of hers. Do anybody know how I can come in contact with her? Any e-mail adress or telefon nr.? I am from Norway. But I have a friend who live in Egypt. Thankyou very much for your help. well i don't like Heba's designs very much bcoz they r so gaudy and she uses very flashy colors.i can see that these designs have very tight tops but not all of her designs r like that. many Egyptians designs look tight simply bcoz most of designers don't design for hijabis so girls buy dresses that r originally for unhijabis and try to make it for hijabis however not all hijabis in Egypt wear those tight tops.and by the way Heba is Palestinian not Egyptian so u can't judge on Egyptian gowns through her designs and she doesn't represent all Palestinians designers as well.